By DJ Salinger, THE LOUVRE – Some people are caring this morning, as the prog rock art world’s most valuable sparkly treasure, the Geddy Leesa, has been reported lost, missing or stolen by its troll minder. “The troll responsible for minding the Geddy Leesa was instead found drunk under a bridge, living the stereotype, shall we say,” ejaculated Constable Constantine Constantinople, 56, of the S1W, whom have been in charging themselves of the case since they heard about it after breakfast. “It was them hermits that done it,” said Trey Bandenhoevel, 30, a troll. Done what, John? Done what? Done lost whom, John? Done lost whom? “The bleedin’ Geddy Leesa, that’s whom, you bloody fool. Now look what you’ve done – you’ve gone and made me spill my noodles,” he went on, warming to the subject. Indeed the noodles were indeed spilled. Plus, the Geddy Leesa, a stunning self-portrait of the stunning Rush bassist Geddy Lee in oil, is worth over a hundred billion pounds in British money, making whomever snatched it a rich enough to run amok for years on end. But is it like even known that the Leesa was stolen? What was all this then about it being “lost, missing or stolen”? “Lost” is British English for “missing”, which is Canadian English for “la maison blanche”, which is a euphemism for the man’s pee pee,” ejaculted Patrice Hey, 24, an hedge fund manger at Billy’s Bank. So…why are the fuzz focusing on “stolen”? So what should people do if they see the Geddy Leesa? 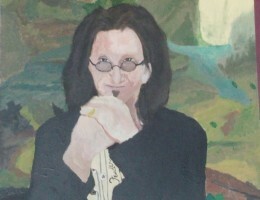 Most of our readers are going to want to know if they find the Geddy Lisa if they get to keep it or not. Whatever happened to the troll whom lost, missed or stole the Leesa? This entry was posted in Thinking Man's Rock and tagged billy's bank, dj salinger, geddy lea, geddy lee, hermits, live the stereotype, progressive rock artworks, rush, S1W, the brutal times, the geddy leesa, the louvre, Thinking Man's Rock, trolls, trolls vs hermits. Bookmark the permalink. huh. somebody swipes the world’s greatest treasure, and not one comment. way to go, planet.